Dec 1/2, Dec 8/9, and Dec 15. 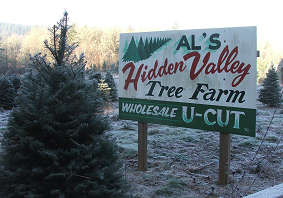 A family owned farm that has been providing the best-grown and cared for Christmas trees to the Eugene and surrounding areas for over 30 years. You won’t have a better time finding your Christmas tree than at our farm. Take a free hay wagon ride through the fields while searching out your tree or warm up with a free cup of hot cocoa, apple cider or coffee while enjoying our covered campfire. We pride ourselves on providing the best trees possible in a family-friendly environment to help you and your family make the most of your Christmas season. Copyright © 2019 Al's Hidden Valley Tree Farm. All Rights Reserved.